The rate of unemployment in the United States has exceeded 8 percent since February 2009, making the past three years the longest stretch of high unemployment in this country since the Great Depression. Moreover, the Congressional Budget Office (CBO) projects that the unemployment rate will remain above 8 percent until 2014. 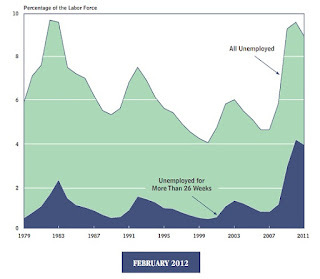 The official unemployment rate excludes those individuals who would like to work but have not searched for a job in the past four weeks as well as those who are working part-time but would prefer full-time work; if those people were counted among the unemployed, the unemployment rate in January 2012 would have been about 15 percent. 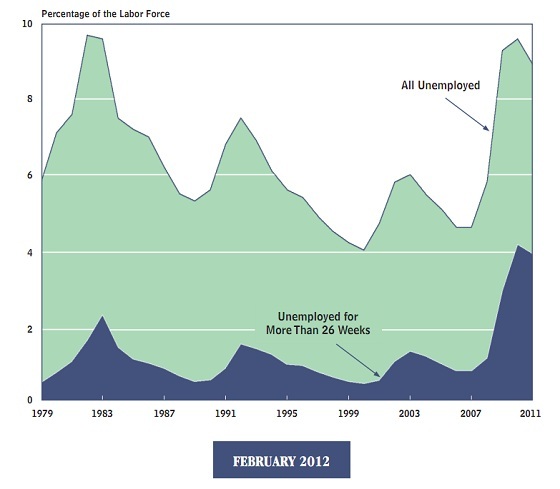 Compounding the problem of high unemployment, the share of unemployed people looking for work for more than six months—referred to as the long-term unemployed—topped 40 percent in December 2009 for the first time since 1948, when such data began to be collected; it has remained above that level ever since.